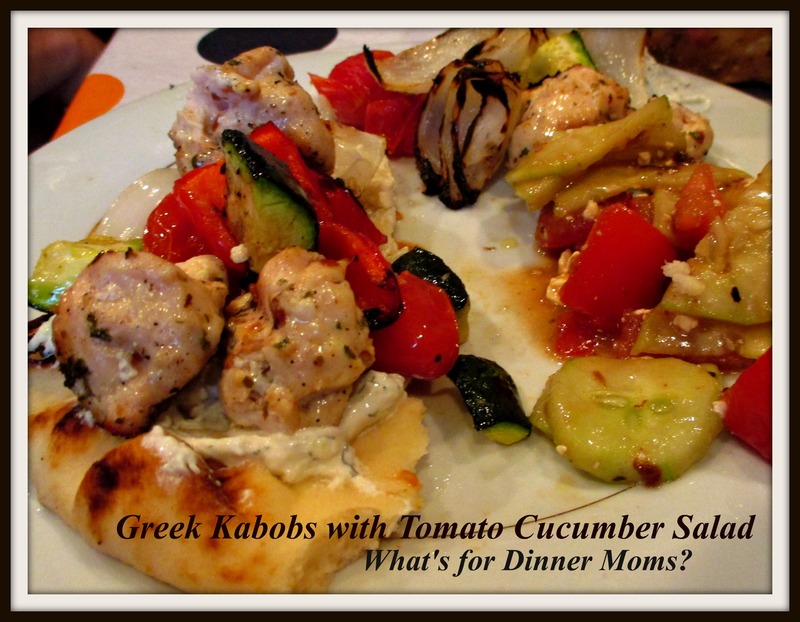 Greek Chicken Kabobs with Cucumber Tomato Salad – What's for Dinner Moms? This is the meal my kids wanted to have for dinner when they returned from camp. I had the chicken marinating in the refrigerator all ready to go when we got home but their concerts lasted far longer than we thought they would so we did not return home until late. The kids decided that drive-through was okay and both said that french fries had never tasted so good. So my meat sat marinating an extra day. I wasn’t sure if the acid in the marinade would break the chicken down too much but it turned out perfect! It was a “Happy Accident” as my son would say. The picture is sloppy but the food is yummy. Getting a beautiful picture of meat, vegetables, sauce, Naan and Tomato Cucumber Salad is near impossible! I should have left the food on the skewers while I took pictures but I take pictures of the food as we are sitting down to eat. This is how the food is as I feed my family. It may not be pretty but we have been eating a huge variety of food for the past three years. My children, and myself, are now fearless food tasters. If it is something we don’t know we will usually try at least a bite before making a decision. And foods that I would never try before just because they sounded yucky such as fish sauce, grape leaves, hoison sauce and any meat with cinnamon I have tried and found out I actually love! I am glad we let the meat sit a bit longer in the marinade. I used breast strips and threaded them on skewers. They were tender and delicious. When I make kabobs I separate my vegetables on different skewers so instead of having one skewer with some meat, onion, tomato, peppers and zucchini, I have skewers with all meat, skewers with all tomatoes, etc… This allows me to put the skewers on the grill at different times. Each gets the perfect cooking time and nothing is raw or overcooked. For my mostly gluten-free son he had all the same things as we did except for the Naan. We used gluten-free tortillas warmed in the oven. He is really good about making substitutions when necessary and I try to keep his food almost identical to ours so he doesn’t feel his is being singled out and not be able to eat the foods he likes. Mix olive oil, red wine vinegar, lemon juice, garlic, oregano, thyme, salt and pepper in large Ziploc bag. Add chicken to bag. Allow to marinate in refrigerator for at least 2-3 hours up to overnight. Soak wooden skewers in a large pan of water for 20 minutes. This will keep your skewers from burning on the grill. Remove chicken from bag and thread onto skewers. Make skewers of vegetables. Brush vegetable skewers with olive oil and dust with powdered garlic. Cook skewers on hot grill until cooked through. The vegetables can be placed on the grill with those taking the longest to cook zucchini, squash first and ending with tomatoes which only need a few minutes to avoid burning or overcooking. Serve with Naan and Tzaziki Sauce. Place shredded cucumber on 3 large paper towels. Pull the corners of the paper towel up and squeeze cucumber until the liquid no longer runs from the paper towels. Place the cucumber in a bowl. Add the rest of the ingredients and stir well. We LOVE garlic and dill weed so you may want to start with less and add more as you stir and taste the dish. My kids call my sauce Nuclear Garlic Sauce. Cover bowl and refrigerate until ready to use. Mix all ingredients in a bowl. Cover and refrigerate for 20 minutes before eating.